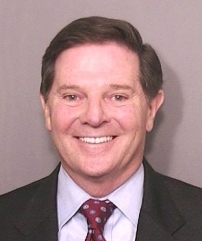 Police photo of Tom DeLay, after his 2005 indictment on election fraud charges. [Source: Mug Shot Alley]The co-founder and editor of the American Prospect, Robert Kuttner, subjects the 2002 House of Representatives to scrutiny, and concludes that under the rule of House Majority Leader Tom DeLay (R-TX), it is well on its way to becoming what he calls a “dictatorship.” Kuttner writes that such authoritarian rule in “the people’s chamber” of Congress puts the US “at risk of becoming an autocracy.” He explains: “First, Republican parliamentary gimmickry has emasculated legislative opposition in the House of Representatives (the Senate has other problems). [DeLay] has both intimidated moderate Republicans and reduced the minority party to window dressing.… Second, electoral rules have been rigged to make it increasingly difficult for the incumbent party to be ejected by the voters, absent a Depression-scale disaster, Watergate-class scandal, or Teddy Roosevelt-style ruling party split.… Third, the federal courts, which have slowed some executive branch efforts to destroy liberties, will be a complete rubber stamp if the right wins one more presidential election. Taken together, these several forces could well enable the Republicans to become the permanent party of autocratic government for at least a generation.” Kuttner elaborates on his rather sweeping warnings. Legislative Dictatorship - The House, and to a lesser extent the Senate, used to have what was called a “de facto four-party system”: liberal Democrats; Southern “Dixiecrats” who, while maintaining their membership as Democrats largely due to lingering resentment of Republicans dating back to the Civil War, often vote with Republicans; conservative Republicans; and moderate-to-liberal “gypsy moth” Republicans, who might vote with either party. Rarely did one of the four elements gain long-term control of the House. Because of what Kuttner calls “shifting coalitions and weak party discipline,” the majority party was relatively respectful of the minority, with the minority free to call witnesses in hearings and offer amendments to legislation. In the House, that is no longer true. While the House leadership began centralizing under House Speaker Jim Wright (D-TX) between 1987 and 1989, the real coalescence of power began under Speaker Newt Gingrich (R-GA) between 1995 and 1999. The process, Kuttner asserts, has radically accelerated under DeLay and Speaker Dennis Hastert (R-IL). Centralized Legislation - Under current practices, even most Republicans do not, as a rule, write legislation—that comes from DeLay and Hastert. Drastic revisions to bills are often rammed through late in the evening, with little or no debate. The Republican leadership has classified legislation as “emergency” measures 57 percent of the time, allowing them to be voted on with as little as 30 minutes of debate. Kuttner writes, “On several measures, members literally did not know what they were voting for.” Legislation written and proposed by Democrats rarely gets to the floor for debate. Amendments to legislation is also constrained, almost always coming from Hastert and DeLay. “[V]irtually all major bills now come to the floor with rules prohibiting amendments.” DeLay enforces rigid party loyalty, threatening Republican members who resist voting for the leadership’s bills with loss of committee assignments and critical campaign funds, and in some circumstances with DeLay’s sponsoring primary opponents to unseat the uncooperative member in the next election. Democrats Shut out of Conferences - In the House, so-called “conference committees,” where members work to reconcile House and Senate versions of legislation, have become in essence one-party affairs. Only Democrats who might support the Republican version of the bill are allowed to attend. The conference committee then sends a non-amendable bill to the floor for a final vote. No Hearings - The general assumption is that House members debate bills, sometimes to exhaustion, on the chamber floor. No more. Before DeLay, bills were almost never written in conference committees. Now, major legislation is often written in conference committee; House members often never see the legislation until it has been written in final, non-amendable form by DeLay and his chosen colleagues. Control of Voting - Kuttner cites the advent of electronic voting machines and the Help America Vote Act (HAVA) as two reasons why Republicans will continue to have advantages at the voting booth. The three biggest manufacturers of electronic voting machines have deep financial ties to the Republican Party, and have joined with Republicans in opposing a so-called “verifiable paper trail” that could prove miscounts and possible fraudulent results. HAVA, written in response to the 2000 Florida debacle, requires that voters show government-issued IDs to be allowed to vote, a provision that Kuttner says is ripe for use in Republican voter-intimidation schemes. Republicans “have a long and sordid history of ‘ballot security’ programs intended to intimidate minority voters by threatening them with criminal prosecution if their papers are not technically in order,” he writes. “Many civil rights groups see the new federal ID provision of HAVA as an invitation to more such harassment.” The only recourse that voters have to such harassment is to file complaints with the Department of Justice, which, under the aegis of Attorney General John Ashcroft, has discouraged investigation of such claims.